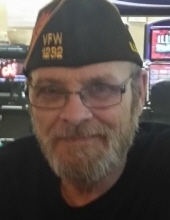 Ronald D. Potts, 61, of Pekin passed away Tuesday, February 5, 2019 at his residence. He was born July 27, 1957 in Pekin to Don and Marion Myers Potts. He married Janet S. Rose November 12, 2000 in Pekin; she survives. He is also survived by his son, Christopher Potts; step-son, Jeramy (Barbara) Brosman; grandchildren, Colton Reader, Jakob Hammond and brother, Terry (Cheryl) Potts. His parents and siblings, Dwight, Rick, Robin and Randy preceded him in death. Ronald served in the U.S. Marine Corps. He loved the VFW and served as the Quartermaster. He enjoyed fishing and boating. Cremation has been accorded and a celebration of life will be held on Saturday, February 16, 2019 at the VFW in Pekin starting at 5 p.m.
To send flowers or a remembrance gift to the family of Ronald Potts, please visit our Tribute Store. "Email Address" would like to share the life celebration of Ronald Potts. Click on the "link" to go to share a favorite memory or leave a condolence message for the family.